Like Joey yesterday, Teddy has been here just over 7 weeks so this is another belated update. He arrived in shoes but has good solid feet and quickly developed a heel first landing. 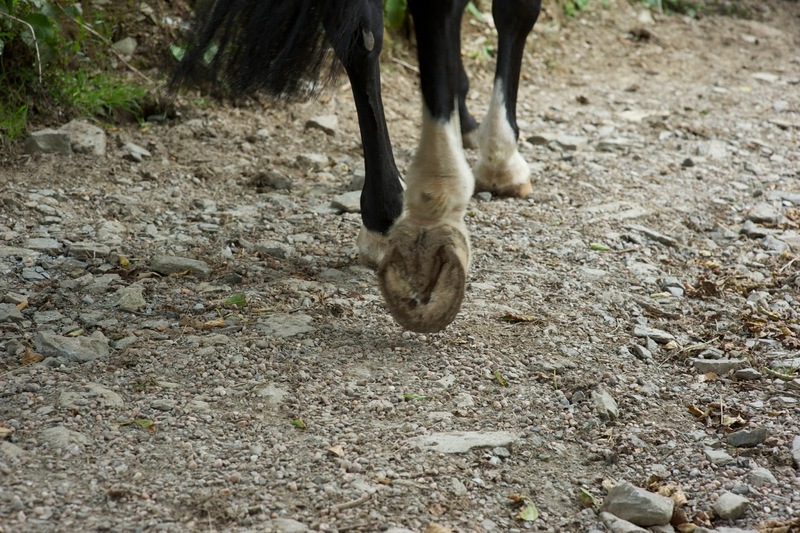 At about 3 weeks out of shoes his feet were already starting to change and it was clear that his toe would shorten as his new hoof capsule grew in. Although he has a long way to go before his new hoof is fully grown he has done a good job over the last 4 weeks of strengthening the back of his foot and you can also see that the stretched white line that was visible at his toe 4 weeks ago has also improved. A horse who lands heel first fairly rapidly always gains a head start over horses who are slower to change and Teddy demonstrates this perfectly. His feet are also developing much better concavity compared to the flat feet he started out with. Well done Teddy and keep up the good work! Joey has now been here 7 weeks and is overdue an update so this comes with apologies for the delay. He arrived in bar shoes which were intended to "support" his palmar hoof and the DDFT injury he had suffered although, as these photos show, his feet are quite capable of providing their own support. The most obvious change from this angle is how much hoof he has grown in 7 weeks, which you can see from the nail holes. Comparing the photos again, the rapid hoof growth is evident along with a shorter toe and in fact the palmar hoof is more supported out of shoes than it was in bar shoes. The reason for this becomes clearer of course when you look at his sole shots. The bar shoe looks impressive but is in fact removing almost all the stimulus which the palmar hoof desperately needs in order to strengthen. Two weeks out of shoes his feet are clearly weak, flat and lacking strength with a weak frog, bars and heels. Five weeks later things are improving with a much stronger frog and a palmar hoof which is developing well even though Joey's landing is not yet as good as it could be. A look at the digital cushion reveals development here too along with a shorter, more balanced foot. Looking at his right foot confirms the changes we've already seen on the left. Look at the hoof 2 weeks out of bar shoes and 5 weeks out of bar shoes and tell me which is better developed and stronger. Lets caption these photos "hoof with artificial support" - above - and "hoof without artificial" support - below - and see which approach has had more effect. 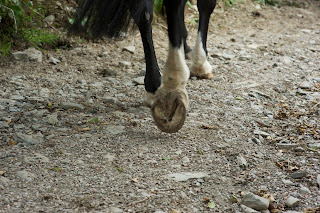 In my opinion, when you compare these photos its pretty hard to justify a role of the bar shoe in hoof rehabilitation. Red arrived nearly 4 weeks ago so I thought an update was in order especially as her owner is coming to see her at the weekend. You can already see the new angle her hoof capsule is growing at which will result in a shorter toe and her nail holes are growing out well too. This foot looks a little strange at the moment as the toe is still long but that will shorten, as we could see in the previous photo, and her heels will also become stronger. A better palmar hoof with the hairline less distorted and the start of a better digital cushion. Red is not yet landing heel first on hard surfaces but I am hopeful this will develop shortly. As with the other foot, the long toe will shorten as her new hoof capsule grows in. This is a foot which is just beginning to change again but she is improving in the right places. As always, there will be more on Red soon. Lenny has been here for 4 weeks now. Although he has made progress he is not yet landing heel first, which is not particularly unusual but is a little frustrating. I am including comparison shots from his arrival, 2 weeks and 4 weeks to give a clearer idea of what is happening to his feet. You can see that his foot is shortening and becoming stronger at the back but its not yet quite enough to give him that good landing. His heels and frog are developing and he is using his palmar hoof more but we aren't quite there yet and his foot is still unbalanced. As with the other foot, this is an improving palmar hoof - less under-run and more stable but just not quite supportive enough at the moment. However when you look from this angle you can see how weak and unbalanced his feet were to start with and you can also see how many changes he is already making so perhaps we shouldn't be too surprised that he isn't quite there yet.